Fitbit Versa first look: A step in the right direction? Fitbit has announced a brand-new smartwatch for 2018. The Versa is a natural upgrade from the Fitbit Blaze and an entry-level option in Fitbit’s smartwatch range; it sits below the Fitbit Ionic. The Fitbit Versa will retail for £199 for the standard edition, with more premium Special Edition options available for £229. It will be released in April. Fitbit acquired Pebble, a company widely credited for kickstarting the smartwatch industry in 2016, predominantly for its software assets. Much of this was evident in the Fitbit Ionic, from the Fitbit OS software to the familiar hardware buttons ripped from Pebble’s own smartwatches. But while there were many familiarities with Pebble’s smartwatches of old, most would agree that the overall industrial design of the Ionic wasn’t one of them. 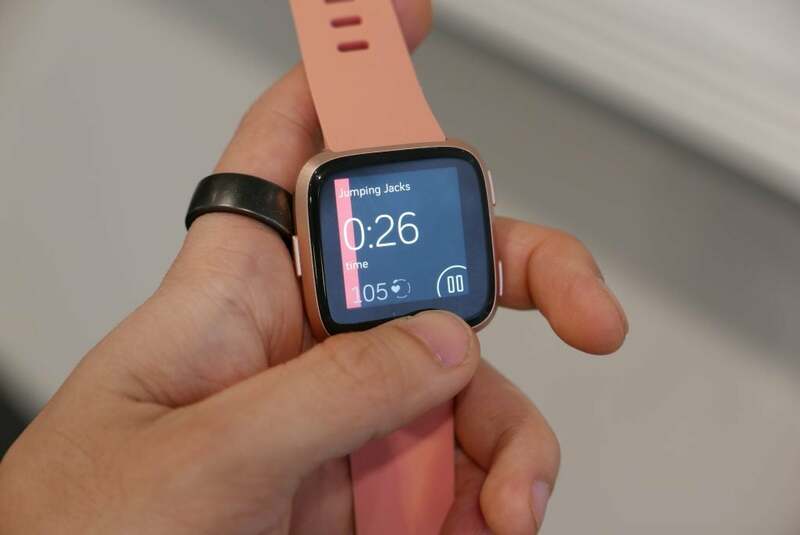 While many of Pebble’s smartwatches were characterised by playful rounded corners and refined edges, the Ionic was considerably more utilitarian in design, with a boxy display and sharp corners. It was a rather masculine design that could well have turned off potential female customers. fitbit is looking to rectify this with its second smartwatch. The Versa looks more like something Pebble would have produced, drawing on many design features from the Pebble Time, in particular. 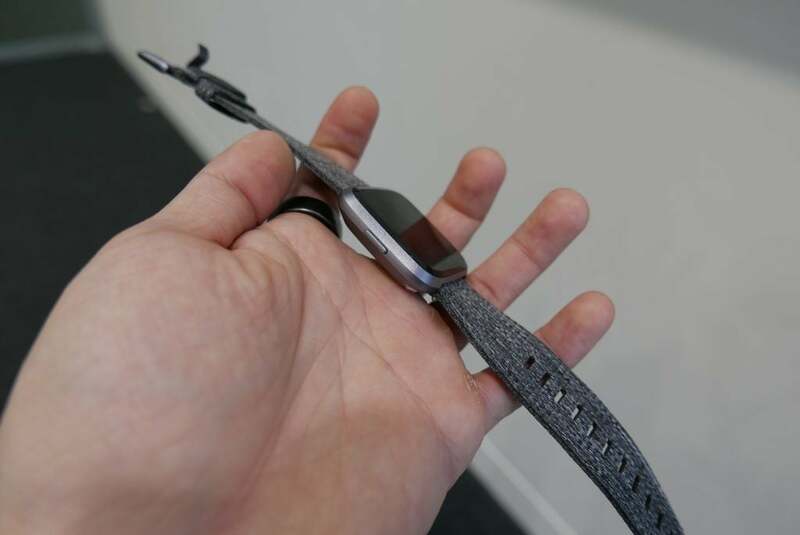 Admittedly, it has a more up-to-date design than the Pebble Time, as if the smartwatch has been dragged into 2018. For starters, the bezel is much thinner around the display. The screen itself is considerably improved, sharing similar specifications to the Fitbit Ionic. It’s crisp and vibrant and, like the Fitbit Ionic and latest Apple Watch devices, can reach 1000 nits in brightness – which makes it easy to view even when outdoors. 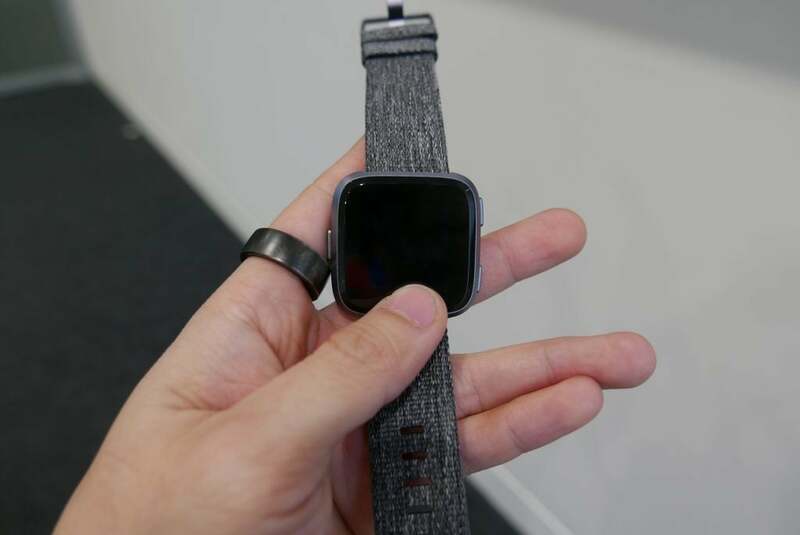 In the hand, the Versa really is a far more approachable wearable than the Ionic. It’s smaller in size and more discreet than the Ionic. It comes in a choice of finishes: black, silver or rose gold. There are also Special Edition options in lavender or charcoal, which come with canvas bands that are only available with the Special Edition. Since these bands aren’t particularly great for sport, standard silicone bands are included too. In common with other Fitbit wearables in the range, there’s plenty of opportunity to customise your device. Quick-release straps are available for the Versa in a wide range of materials including metal, silicone, leather and canvas. The big difference between the Versa and Ionic when it comes to specifications is the lack of GPS. This means you’ll need to keep a paired smartphone in tow to use the Connected GPS option for more accurate distance and route mapping of outdoor workouts. The Ionic has integrated GPS, allowing you to leave your phone behind. Otherwise, when it comes to specs the Versa is very similar to the Ionic. It includes the PurePulse heart rate monitor on the back, alongside a Relative SpO2 sensor – which up until now has been pretty redundant. The sensor has the potential to track blood oxygen levels, which can be applied to monitoring health conditions such as sleep apnoea. There’s integrated storage onboard for both apps and storing music. Fitbit OS now plays nice with Deezer, so you can download offline playlists from the streaming service and pair Bluetooth headphones for a phone-free experience (provided you don’t want GPS as mentioned). You’ll get a three-month Deezer trial with the Versa. You can also transfer your own music to the Versa much like the Ionic. Since the Versa runs the same Fitbit OS as the Ionic, the experience is similar, using the same touchscreen interactions alongside the hardware buttons. There will be new introductions to Fitbit OS with the launch of the Versa, however. It’s worth noting that these will become available across all Fitbit devices, but with a custom experience for Versa and Ionic owners. As mentioned, Fitbit wants the Versa to appeal to a wider audience, and part of that audience is female. As such, Fitbit will be debuting female health tracking in the app. Fitbit told me that 25% of women it surveyed were already using some form of menstrual cycle tracking, and adding the capability to its devices was one of the top five requests from Fitbit’s female users. So now you’ll be able to record your menstrual cycle. This includes being able to label your energy levels and mood throughyour cycle, so you can begin to see patterns and make informed predictions. In addition, for those looking to conceive, female health tracking might become a valuable tool to monitor your reproductive health. Other returning elements of Fitbit OS include the Fitbit Coach, which again offers up a number of free dynamic workouts direct from your wrist alongside additional workouts through a subscription. There have also been some tweaks to the way in which data is displayed on your wrist in what Fitbit is calling an integrated dashboard. Step goals and heart rate trends are shown on new interfaces, letting you more easily keep an eye on daily progress or your resting heart rate. It’s a small but helpful tweak. The Versa will support Fitbit Pay, and the company says that its contactless payment system is currently supported by 32 banks in 14 countries, with more arriving. Those numbers are a little misleading for UK users, where none of the major high-street banks currently support the payment platform. Apps were a major shortcoming of the Ionic smartwatch when it first launched, and while the landscape is marginally better now, it’s still considerably behind the likes of watchOS, Android Wear and Tizen. Fitbit claims there are now 500 apps and watch faces on the Fitbit OS app store, with 5000 developers on board. Hopefully that bodes well for the future of Fitbit OS – but right now, support is lacking. Battery life has always been one of Fitbit’s strong points; it was one of the better features of the Fitbit Ionic. Thankfully, this remains the case with the Versa, with Fitbit promising more than four days of battery life. This is double what you’ll see from an Apple Watch and most Android Wear wearables. Fitbit wants to widen its smartwatch customer base, and on first glance the Versa looks like a step in the right direction. The chunky and inelegant Ionic was unlikely to appeal to all, so the more attractive design of the Versa will certainly help in this regard.